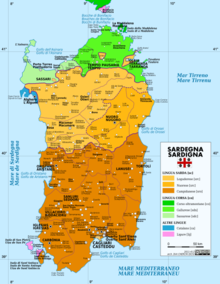 Gallurese (gadduresu) is a Romance language spoken in the northeastern part of Sardinia. It is seen as being related to the Corsican language and Sardinian language. The language takes its name from the region of Gallura. ↑ Hammarström, Harald; Forkel, Robert; Haspelmath, Martin, eds. (2017). "Gallurese Sardinian". Glottolog 3.0. Jena, Germany: Max Planck Institute for the Science of Human History. This page was last changed on 17 August 2018, at 18:16.